Loosen those belts and get the treadmill ready. 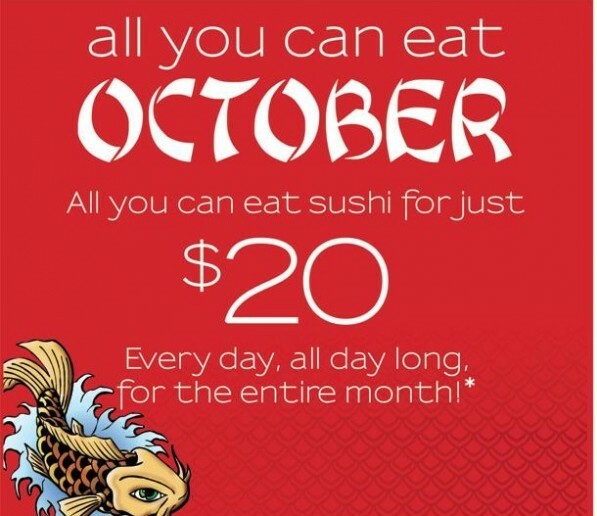 Koi Sushi is offering all-you-can-eat sushi for only $20 all month at each of their locations. While the deal is only on select rolls, the list is huge and consists of favourites such as the Firecracker and the Golden Dragon. Now if all-you-can-eat is a bit much for you, they are also offering another limited time special. From Wednesday, October 17, 2012 until Sunday, October 21, you can get 2 for 1 Golden Dragon Rolls. If you purchase one Golden Dragon Roll at full price you get second Golden Dragon free! The Golden Dragon consists of shrimp tempura, cream cheese, cucumber and is topped with tempura sweet potato and house sauces. The offer is limited to one per person per order and is available for both dine-in and take-out. Reservations required for dining in and be sure to tell them WindsorEats sent you.